Recorded in various spellings including Hollow, Hollows, Hollaway, Hollway, Hollwey, Holloway and Holoway, this is an English medieval surname. It is either locational from various places in England called Holloway, or topographical for someone who lived in or by a "hollow". Both derive from the pre 7th century word "holh", meaning hollow or sunken. The surname first appears in the early 12th century (see below), and other early recordings include: John de la Holeweye, who was listed in the Assize Rolls of Somerset in 1242, and Peter in le Halwye, an interesting mix of English and French, in the Hunbdred rolls of Cambridge in 1273. The Court Rolls of the Manor of Wakefield, the primary manor of Yorkshire, list John del Hollewaye as living in Yorkshire in 1308. 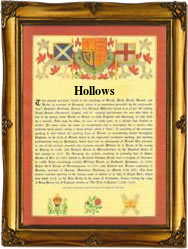 A notable namebearer, listed in "The Dictionary of National Biography", was Sir Charles Holloway (1749 - 1827). He was a major-general in the royal engineers, and was knighted in 1803 after an illustrious campaign as commander of the Turkish army in Syria and Egypt against the French. The first recorded spelling of the family name is shown to be that of Richard de Holeweia. This was dated 1130, in the Pipe Rolls of Devonshire, during the reign of King Henry 1st of England, 1100 - 1135. Surnames became necessary when governments introduced personal taxation. In England this was known as Poll Tax. Throughout the centuries, surnames in every country have continued to "develop" often leading to astonishing variants of the original spelling.